The first applications of vibration for the improvement of human performance were developed in ancient Greece. As a therapy, the whole body vibration (sometimes abbreviated as WBV) was explored by Russian Scientists who tested vibration on astronauts in an effort to decrease the loss of muscle and bone mass in space. 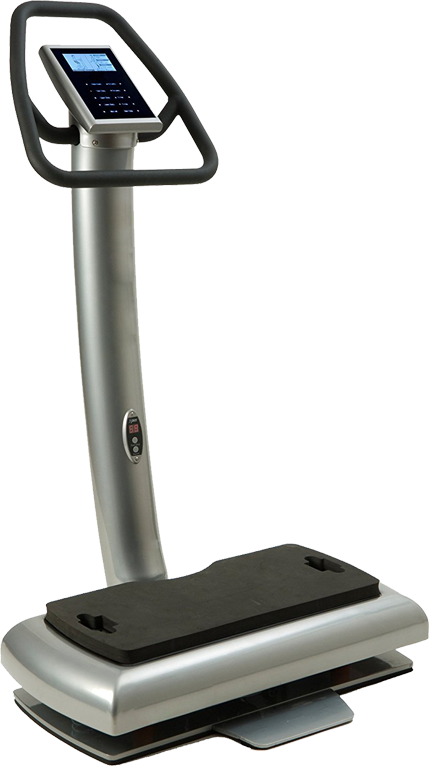 Recently whole body vibration platform have been popularized and in home gyms as one of the hottest new trends in exercise. Because more muscle fibers (also known as motor units) are activated under the influence of vibration than in normal, conscious muscle contractions the muscles are incited more efficiently (Paradisis & Zacharogiannis_2007 ; Lamont et al. 2006 ; Cormie et al 2006 ;_Bosco et al. 1999 , 2000 ; Rittweger 2001 , 2002 ; Abercromby et al. 2005 ; Amoette et al. 2005 ). The immediate effect of WBV s therefore that the muscles can be used quickly and efficiently, rendering then capable of producing more force. However, this process will only be effective if the stimulus is not too intense and does not last too long, because otherwise performance will diminish due to fatigue. Another immediate effect of WBV is an improvement in circulation. The rapid contraction and relaxation of the muscles at 20 to 50 times per second basically works as a pump on the blood vessels and lymphatic vessels, increasing the speed of the blood flow through the body (Kerschan-SCHINDL ET AL 2001 ; lOHMAN ET AL.2007 ). subjects often experience this as a tingling, Prickling, warm sensation in the skin. Both Stewart (2005 ) and Oliveri (1989 ) describe the appearance of vasodilatation (widening of the blood vessels) as s result of vibration. Long term effects of WBV In order to have any effects on the body term it is vital that the body systems experience fatigue or some sort of light stress. As in other kinds of training, when the body is overloaded repeatedly and regularly, the principle of supercompensation will occur. This principle is the cause of the body adapting to loading. In other words: performance will increase. Another important difference between conventional training methods and WBV is that there is only a minimum of loading. No additional weights are necessary, which ensures that there is very little loading to the passive structures such as bones, ligaments and joints. That is why WBV is extremely suited to people that are difficult to train due to old age, disease, disorders, weight or injury. On the other hand, it is also very suitable for professional athletes who want to stimulate and strengthen their muscles without overloading joints and the rest of the physical system (Cochrane et al 2005 ; Mahieu et al 2006 ). Whole body vibration training is an excellent adjunct to the Laser-Like Lipo treatments and can help accelerate the results of any treatment. The information provided on this website is general in nature and is meant as an information resource only. It is not intended for the purpose of providing medical advice. Nor is it to be used as a substitute for any diagnostic or medical treatment purposes by a qualified, licensed healthcare professional or physician. Before and after photos published on this website by Creative You Body Sculpting are of actual patient outcomes. These outcomes are by no means a guarantee of results, whether expressed or implied. Individual results are affected by many factors and will vary by person. Testimonials and images do not constitute a promise, guarantee or representation of any particular outcome or experience, again, whether expressed or implied. Use of Creativeyoubodysculpting.com constitutes acknowledgment and acceptance of the limitations and disclaimers described here. How We Collect, and Use Information We may collect and store personal or other information that you voluntarily supply to us online while using the Site (e.g., while on the Site or in responding via email to a feature provided on the Site). We use the information we collect from you while you are using the Site in a variety of ways, including using the information to customize features and advertising that appear on the Site and gathering information that better allows us to provide our services. Childrenâ€™s Privacy Statement This childrenâ€™s privacy statement explains our practices with respect to the online collection and use of personal information from children under the age of seventeen, and provides important information regarding their rights under federal law with respect to such information. â€¢	This Site is not directed to children under the age of seventeen and we do NOT knowingly collect personally identifiable information from children under the age of seventeen as part of the Site. We screen users who wish to provide personal information in order to prevent users under the age of seventeen from providing such information. If we become aware that we have inadvertently received personally identifiable information from a user under the age of seventeen as part of the Site, we will delete such information from our records. If we change our practices in the future, we will obtain prior, verifiable parental consent before collecting any personally identifiable information from children under the age of seventeen as part of the Site. â€¢	Because we do not collect any personally identifiable information from children under the age of seventeen as part of the Site, we also do NOT knowingly distribute such information to third parties. â€¢	We do NOT knowingly allow children under the age of seventeen to publicly post or otherwise distribute personally identifiable contact information through the Site. â€¢	Because we do not collect any personally identifiable information from children under the age of seventeen as part of the Site, we do NOT condition the participation of a child under seventeen in the Siteâ€™s online activities on providing personally identifiable information. How to Make Changes to Your Information If you would like to request to have the information you provided on the site, please call the number attached to the website and request to have your information changed or deleted from the company records. Your California Privacy Rights California Civil Code Section 1798.83, also known as the â€œShine The Lightâ€ law, permits our customers who are California residents to request and obtain from us once a year, free of charge, information about the personal information (if any) we disclosed to third parties for direct marketing purposes in the preceding calendar year. If applicable, this information would include a list of the categories of personal information that was shared and the names and addresses of all third parties with which we shared information in the immediately preceding calendar year. If you are a California resident and would like to make such a request, please call the number listed on the site.